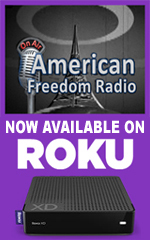 "American Freedom Radio" is proud to bring you the best variety of alternative shows on the Internet. Our hosts have no rules, no taboo topics and most importantly we do not puposely promote fear as others do. We are not a corporate monolith that supports itself by fabicating the truth with the talking points of the "manipulators." If you have the ability to help us stay on the air and help us grow, please use the buttons below to help us fight the info war. Thank you for being awake, aware and ready to go the extra mile. You are the real heroes! 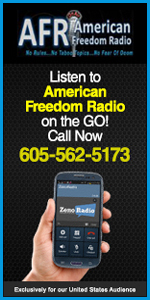 Thank you for your support of American Freedom. HELP US GROW AS FAST AS POSSIBLE! IF YOU HAVE THE ABILITY TO BE A REGULAR DONOR TO HELP US PAY FOR OPERATING EXPENSES. WE ARE TRULY COMMITTED TO EXPANDING OUR REACH AT THIS CRITICAL MOMENT IN TIME AND YOUR CONTINUED SUPPORT WILL HELP US GET THERE IN THE SHORTEST TIME POSSIBLE, HOPEFULLY BEFORE IT'S TOO LATE. PLEASE HELP TODAY! THANK YOU. PLEASE NOTE: Postal Money Orders are preferable. Please Leave the "Pay To The Order Of" Line Blank Until We Decide Our Banking Options. We Don't Have Much Faith The corrupt Banking System and we are exploring other options.